The global aerial imagery market is anticipated to reach USD 5.2 billion by 2024, at a CAGR of 14.5% during 2018-2024. The high growth of this market is attributed towards the ability of aerial imagery to provide sudden view that is primarily used in construction activities such as development of thermal or water-based project. Moreover, improved vision point that helps in providing augmented view from distant angles of larger area in order to witness surface of earth in more authentic manner is the major factor driving the growth of the market. On the basis of type, the aerial imagery market is segmented into vertical, low oblique and high oblique. Among these segments, high oblique category is expected to witness the fastest growth of 15.3% CAGR during the forecast period and the vertical imagery segment is projected to generate revenue of USD 1.9 billion by 2024. The aerial imagery market on the basis of the application is segmented into surveillance and monitoring, geospatial, conservation and research, construction and development, disaster management, exhibition and entertainment, and energy and resource management. The technology is gaining huge popularity in various segments as it enables the organizations in recording and monitoring surface of the earth that deliver advanced imaging resolutions and the ability to freeze time. Among the various applications, surveillance and monitoring application account for the largest revenue in the market with more than 20% share in 2017. Different end users in the aerial imagery market include government, civil engineering and archaeology, defense, energy and mining, media and entertainment, agriculture and forestry, and others. Government is the largest end user of these solutions, accounting for more than 30% revenue in the aerial imagery market, globally. Increasing adoption of aerial imagery in several areas such as surveillance and monitoring, energy and resource management, geospatial, conservation and research and disaster management is the major factor driving the growth of the aerial imagery market. Moreover, frequent occurrence of natural calamities across the globe such as floods, fire, earthquakes, tornadoes, and cyclones are extensively revamping the usage of new imagery solutions in order to visualize actual loss of property and life. Additionally, this technology is extensively gaining huge momentum in order to chart information after disaster occurrence since it offers images with high resolution that are understandable and easy to access by the teams of disaster management. Rapid innovation in cameras is further driving the growth of the aerial imagery market. Technological upgradation in cameras such as the inclusion of ultra-refined images with high-resolution pixels is bolstering the demand for these solutions across several business enterprises. The increasing geometric distortion in images and security concern related to no-fly zones (NFZ) are the major factors hindering the growth of the aerial imagery market across the globe. Globally, industry players in aerial imagery market are leveraging market growth through partnership agreements and acquisitions. The key players are further focusing upon technological advancements to develop novel environment for aerial imagery. This is further strengthening the market presence and position of these organizations in the global market. Geographically, North America accounted for the largest revenue of USD 841.8 million and is also expected to witness the fastest CAGR of 15.5% during the forecast period in the market. The region is the largest market owing to increasing technological advancement in the mapping of sky rise buildings, oil & gas plants and dams. 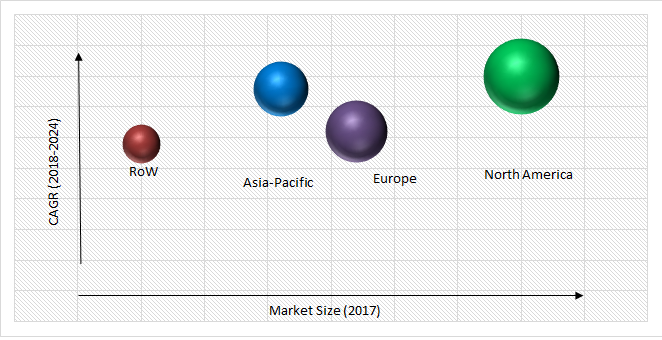 Additionally, increasing investment in smart city regions and expansion in urbanization is expected to further bolster the growth of aerial imagery market in North America. Moreover, Asia-Pacific is expected to witness considerable growth during the forecast period due to increasing demand for surveillance and monitoring in order to resist global threats. The aerial imagery market is observing acquisitions by the key players, also there are companies that are increasing their market share by technological advancements and new product development. Some of the major players in the aerial imagery industry are EagleView Technologies, Inc., Fugro N.V., Digital Aerial Solutions LLC, Google Inc., Kucera International Inc., Blom ASA, Getmapping PLC, Nearmap Ltd., High Eye Aerial Imaging Inc., and NRC Group ASA. 10.10. High Eye Aerial Imaging Inc.
Table 134 Snapshot – EagleView Technologies, Inc.
Table 135 Snapshot – Fugro N.V.
Table 136 Snapshot – Dell Boomi Inc.
Table 138 Snapshot – Google Inc..
Table 139 Snapshot – Kucera International Inc.
Table 142 Snapshot – Nearmap Ltd.
Table 143 Snapshot – High Eye Aerial Imaging Inc.